After a few long days of traveling, we were glad to have a day of rest on Sunday in Ajijic. Lake Chapala is supposed to have one of the most pleasant year round temperatures in the world, and we found it to be perfect; not too warm and not at all cold. On Sunday morning we walked next door to a little restaurant where we enjoyed a nice breakfast: fresh orange juice, chilaquiles for some of us, eggs for the rest, all accompanied, of course, by beans and tortillas. With bellies satisfied, we ventured beyond the square to explore a little of the town. Erik was glad to find a cafe where he could get a real cup of coffee. The shop was tastefully decorated in a coffee theme; chairs were upholstered with coffee sacks, and the tables had coffee beans under glass. They had their roaster right in the front of the shop, and Raphael was thrilled to get to “zoast” some coffee! After a bit of wandering, we walked down to the lake, which was just a few blocks from where we were staying, and took a nice walk along the malecon. The kids enjoyed a couple of different playgrounds, and Erik and I relished the fresh air and beauty of the lake and surrounding mountains. 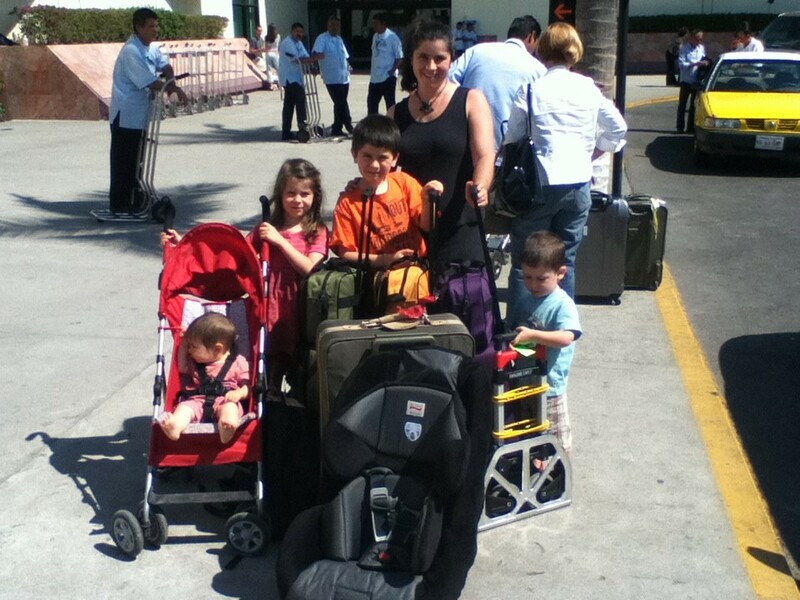 We struck up a conversation with another visiting family from Ireland who were in Mexico adopting a child. One of the things I love about traveling is meeting people from all over the place. We found a little restaurant where we could get some lunch. It was just the kind of place I like; no menu, just a woman who is happy to tell you what she’s made. The special that day was enchiladas, which we all enjoyed. Siesta followed lunch, as is fitting, and then we had to deal with the problem of a dead battery on our rental van. Now, at home a dead battery isn’t much of a big deal; there’s always someone around who can help out. But there we weren’t really sure who to turn to. Erik called the rental agency, which was supposed to get back to him in 15 minutes and send someone out to help. I’m glad we had a plan B, because we never did hear back from them! While waiting, Erik called Alexsi, who got in touch with a friend of his who had a car and was willing to come and give us a jump start. Anastasia and I took the kids over to play in the plaza while the men did their car stuff. We bought some snacks for them , twice fried french fries and hot dogs with Mexican ketchup (yuck, yuck, yuck!) and refreshing watermelon. There had been some sort of a celebration in the square earlier that day, and the ground was littered with egg shells and brightly colored confetti. Apparently the custom there is to break these confetti-filled eggs over one another’s heads to during festivals like this. There were still a few vendors selling eggs, so I bought a bag and let the kids have at it! It was fun, although I think it took days to get all the confetti out! Even Pearl got in on it! We enjoyed some inexpensive tacos at a nearby stand, and then said our goodbyes to Alexsi and Anastasia. It was a real pleasure to meet them, and we hope that our paths will cross again in the future. We ended the evening with ice cream, and then turned in to our hotel. Erik went out later and bought me a snack of roasted fresh garbanzo beans, still in the pods. They were delicious; smoky and salty and satisfying. On Monday morning we revisited the little restaurant next door, and then were “on the road again”. We took the more direct route through Guadalajara back to Bucerias. The toll highways, while expensive, are well maintained. We drove back through the mountains, the Sierra Madre Occidental, and past fields and fields of agave - this is tequila country. We stopped in a small town for gas and tacos, and soon found ourselves driving south along the coast once more, through towns we visited last year; Rincon de Guayabitos, Sayulita, Lo de Marcos. We stopped by the side of the road where I paid 35 pesos (less than three dollars) for a papaya and a pineapple; I just had to eat a little more fruit before we left! We arrived back in Bucerias by mid-afternoon, in time for a swim before dinner. That evening we found ourselves eating again at Lucy’s; it seems we often find a little place where we really connect with the people, and this time it was Lucy. She had a sad sweetness, and was very kind to us. She gave each of the kids a notebook one evening, and always remembered their names. Raphi loved the mariachi bands! Tuesday was our last full day in Mexico, and we decided to visit the beach one more time. Even though we were pretty close to it, we really only went a few times; it’s just a lot of work to haul everyone and the gear down there and back again. With a pool right outside the door, it’s easier just to do that. When we got down to the beach we saw what looked like a snake washed up on the shore. Upon closer look we realized it was an eel, and it was pretty interesting to see it up close. We watched it for a while and then Erik threw in back into the water. I had fun building a sand castle with the kids, and also swimming with Peregrine. The afternoon was mostly spent packing and trying to get things as ready as possible for the next day’s departure. We walked into town for a little last minute shopping and dinner at one of the nice restaurants on the beach. It was the only time we did that, and we really enjoyed watching the sun set over the top of the bay and eating our dinner to the rhythm of the waves lapping on the sand. Peregrine kept saying that he wished he could make that day last for a week, and I had to agree; it was hard to leave. On Wednesday morning we walked down to get some breakfast. As is often the case, the nearby place we planned to go to was closed and we ended up walking a lot further than we’d anticipated. We enjoyed our breakfast of fresh squeezed orange juice, chilaquiles, and eggs, rice, and beans, and then took a taxi back to our place. The kids went for a swim while I did the final packing. I kept wishing I could jump in the pool too, and then realized that I would regret it if I didn’t make time for one last swim with them. I was glad I did; it was refreshing, and I had so much fun paddling around the pool and playing with them. Erik cut up some mangoes and pineapple for a snack, and then the taxi van was there for us around 11:15. We all piled in, along with our luggage, and headed south towards Puerto Vallarta. We stopped to buy a roasted chicken to eat at the airport, having been stuck last year eating at Carl’s Jr. (It was our most expensive meal in Mexico last year, and by no means our most enjoyable. I didn’t want to repeat that!) We had a long day of travel ahead of us; fifteen hours until we got home if everything went as planned. With all the kids in their own seats in the van, Erik and I sat together and held hands, enjoying our last few minutes there. Once we got to the airport we were kicked into gear; waiting in lines, trying to keep track of kids, getting ticketed, trying to keep track of kids, having bags inspected, rounding up kids, eating lunch, herding kids, going through security, trying to keep kids together, and finally onto the plane. We managed to travel with only one checked suitcase and a pretty good pile of carryons. One blessing was when we checked in at Puerto Vallarta they offered to check some more of our bags for free, so we ended up with less to maneuver through the rest of the airports. Of course when we arrived in LA we had to get all of our luggage in order to go through customs there. I’m always intrigued seeing people from all over the place in the customs hall; I want to know their stories, where they’re coming from, why they’re coming, what they’re hoping for. There was one family who looked like they were from Tibet or maybe Mongolia, traveling with a huge pile of plaid plastic bags like I remember using in India; I would have loved to hear their story in particular. We’d brought some bananas to eat on the plane and not thought to throw away the few we had left before disembarking. Because of this we got “the scarlet letter”, a big red A for agriculture, on our customs card, and were sent into the secondary inspection line where we got to wait some more. (And try to keep kids together!) After sending our bags through the x-ray machines again and handing our food over to the gloved inspector, he kindly told us that whoever sent us must not know that it’s fine to bring bananas in from Mexico. We had to go through security again in LA, and I was so, so thankful that we were passed right through without being subject to the scanners or any “enhanced” pat downs. We had just enough time to make it to our terminal and eat some highly overpriced and not so tasty airport food before boarding our next plane to Seattle. One nice thing about traveling with small kids is pre-boarding, and we take advantage of it! The flight to Seattle was smooth, and by the time we arrived there around 8:30 we were all pretty exhausted. (Our bodies were telling us it was more like 10:30, way past the kids’ bedtime. We were thankful to find a nice big play room where we could sit and the kids could play. They had fun, although Raphael was walking around looking like a little zombie, all glazed over and not quite sure what was going on. We boarded our final plane around 10:30. Because it was a smaller plane we had to walk out onto the tarmac to board, and were met with freezing temperature and heavy snow falling. What a change from the sunny skies and warm morning we’d had! We had to sit on the plane for quite a while so they could de-ice it, but we were finally on our way. I expected this last leg of our journey to be a rough ride, but it really wasn’t bad at all. Poppy and Pearl fell asleep right away, and Raphael didn’t take long either. Peregrine finally gave in shortly before we landed close to midnight. We were thankful to be home safely after a very long day of traveling. And so we’ve been there and back again, to our beloved Mexico. I’m so thankful for these times we’ve had together there, making memories with our children. Can’t wait until next time!